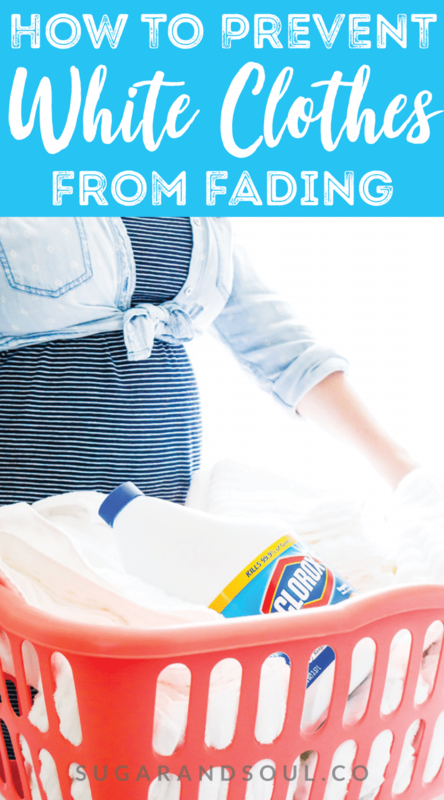 Want to know How To Prevent Whites From Fading? 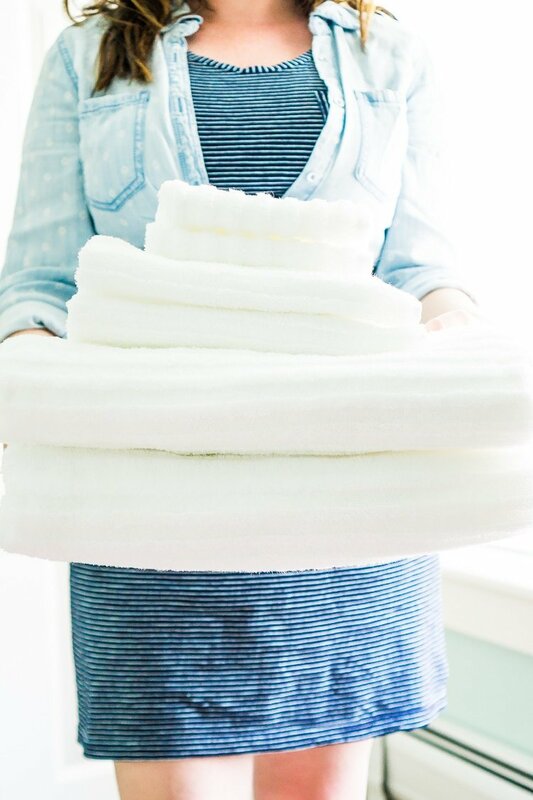 From treating stains to how to wash them on a regular basis, follow these 6 simple steps to ensure bright whites for all of your linens! Black may be your go-to shade for a night out, but when it comes to your daytime whites, you want them to be pure and bright. Clothes that become stained or just downright dingy can even make you look sloppy. The good news is, those merlot or dreaded armpit stains don’t have to mean the end for your favorite wardrobe staples if you know a few tricks! First and foremost, exercise caution: you should always read the cleaning instructions on your clothing tags, spot-test new treatments in discrete areas (in case of a bad reaction), and leave “dry clean only” clothes to the professionals. For bleach-safe clothing, one of the easiest, cheapest, and most effective ways to brighten whites is with Clorox bleach. 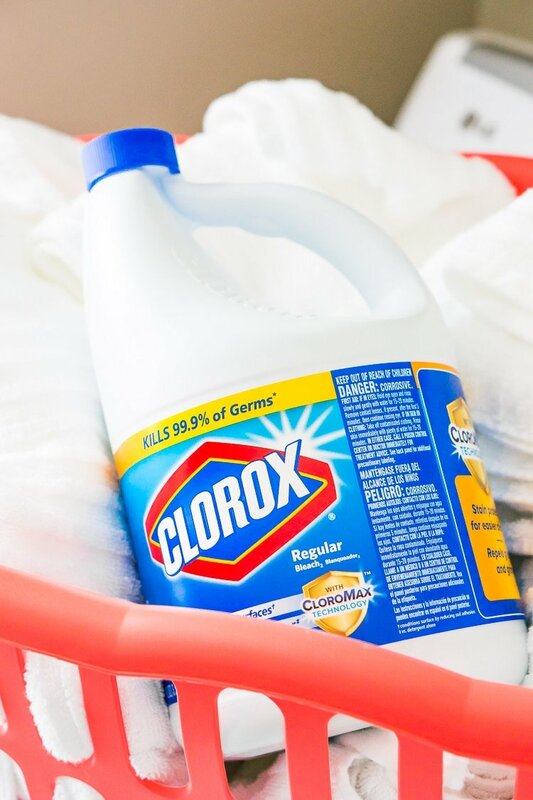 Available at Walmart or walmart.com for less than $3 a jug, Clorox Regular-Bleach₂ with CLOROMAX® adds a serious boost of whitening to your laundry load. 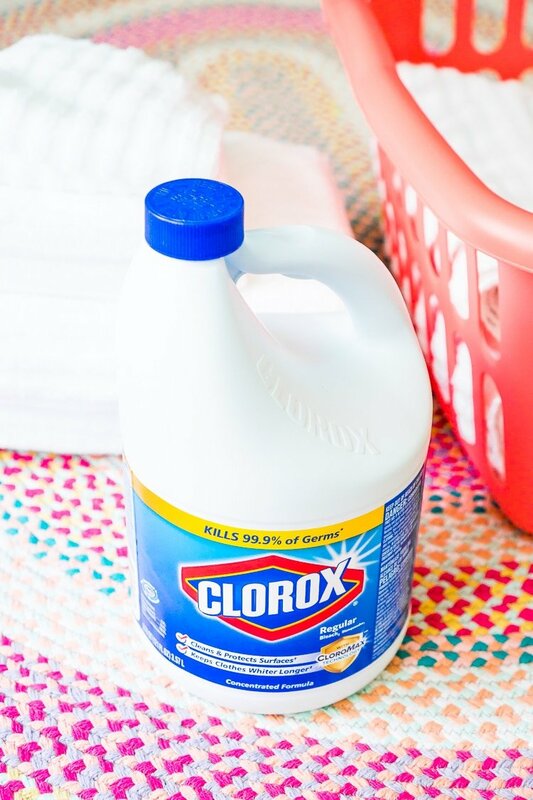 Simply add 1/2 cup of Clorox Bleach With Cloromax Technology per gallon of water to your bleach-able laundry load. 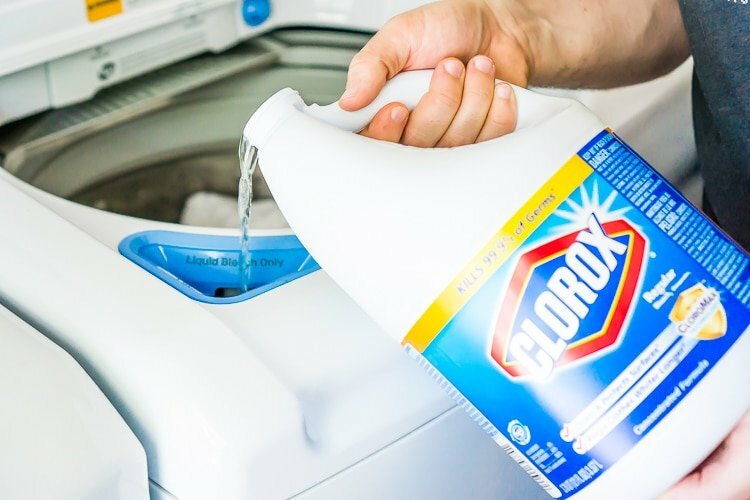 You can pour it right into your washing machine’s bleach dispenser, and if yours doesn’t have one, add it in 5 minutes after the cycle has begun. Just remember, not all clothes are bleach-friendly, so reading the care instructions is a must. Not all stains or fabrics are created equally, but luckily, there are lots of ways you can tackle certain spots on all your garments! Try the following tips for keeping your white clothes glowing, no matter how much you wear them. Even people with the most colorful closets like to don white pants, sundresses, and t-shirts from time to time, and when you do, make sure they’re as pristine as possible! 1. Treat stains ASAP. It’s Murphy’s law: the day you wear your billowing white blouse is the day you spill coffee all over it. If this happens to you, blot (don’t rub) the area with a paper towel or white cloth, since a colored one might bleed. Then, dab it with either club soda, a mixture of water and hydrogen peroxide, or white vinegar — whatever is available. Once home, treat the spot with stain remover before washing. 2. Know how to tackle different kinds of stains. Of course, some stains need a little extra attention. For stubborn grease stains, make a paste of baking soda and water and let it sit on the spot for 30-60 minutes. Or, your oil-absorbing dish soap can do the trick if you apply it before washing. When it comes to those dreaded yellow armpit stains, there are several ways to handle them. One is to apply vinegar to the discolored area, and another is to make a paste with baking soda and water and let it sit for a couple hours before washing. Fun fact: it’s thought that the actual cause of the discoloration isn’t the sweat itself, but the deodorant mixing with the moisture. To prevent those icky marks from creeping in again, treat the underarm area of your shirts with stain remover every time you toss them in the laundry. 3. Launder every wear or two. Washing your whites every time you wear them (or every other time, if it’s just for a few hours) is especially helpful when it comes to preventing the buildup that leads dinginess or underarm stains. 4. Separate whites and colors. You learned this rule in college, and there’s simply no way around it. Whites and colors must be separated in order to keep the dyes from bleeding! 5. Wash your whites in warm water, if you can. If you can, clean your clothes in warm or hot water for the deepest clean possible. Again, make sure to read the instructions carefully, because shrinking or warping your whites defeats the purpose! 7. Make bleach your best friend. As mentioned above, a little bleach can demolish stains and general dinginess in all your bleach-safe clothes! I like Clorox Bleach With Cloromax Technology, which not only brightens whites, it eliminates as well as 99.9% of germs. (That’s also why I also love using it on my white linens.) If you want your whites to be more brilliant (and cleaner!) than ever before, you should always keep a jug of Clorox by your washing machine.